Create colorful mischief and mayhem with the Minions Crayola Creativity Case with Markers and so much more. It includes craft supplies based on the fun characters from the hit movie. 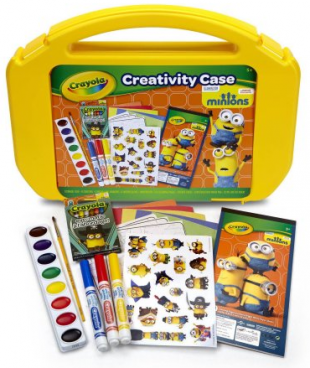 This handy Crayola Ultimate Art case includes eight Minions-themed crayons, a 20-page sketch tablet, three broadline Ultra-Clean markers, eight watercolors and brush, 10 coloring pages, one sheet of stickers and a 30-page mini construction paper pad.